Rafael Nadal has been forced to withdraw from the Medibank International due to a persistent injury to his left foot. The pre-qualifying tournament for the Medibank International and which was open to Australian players only, was completed today with Sadik Kadir and Adam Feeney winning through in the final round. The two players will now receive wild cards for the qualifying event for the Medibank International. The singles seedings for the 2006 Medibank International were announced this afternoon and as expected Lleyton Hewitt and Kim Clijsters head the respective lists. Visitors will be able to meet their tennis heroes and try out their tennis skills at FanFest every day of the tournament then go and check out the kinds of racquets the legends of the game used to play with and tennis fashion at the Australian Tennis Museum. There will also be a Courtside Mini Film …..
Sony Ericsson, �Official Entertainment Sponsor� of the Medibank International, today announced a range of unique entertainment initiatives for the 2006 tournament, commencing Sunday January 8. Headlining the entertainment is Australian music super-star Vanessa Amorossi, who will perform a concert f…..
Never before in the history of the Medibank International have two former tournament champions and world number ones clashed in the first round. That�s the situation in the bottom half of the women�s draw as fifth seed Justine Henin-Hardenne takes on comeback player Martina Hingis. 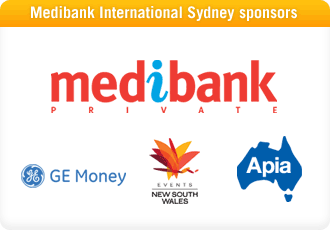 A sensational day of tennis is scheduled for tomorrows Medibank International. The mercury made it hot off the courts but the tennis action around the Sydney International Tennis Centre made it hotter on the courts at the Medibank International. Big hitting Serbian Ana Ivanovic booked her position in the quarterfinals with an impressive 6-3, 7-5 win over world number three and…..
Lleyton Hewitt was glad for a more comfortable match compared to his first round which went three sets. The top seed and defending champion defeated Austrian Jurgen Melzer 6-1 6-4 to secure a place in the quarterfinals. He ran away with the first set in 37 minutes but the second set took a bit longe…..